Octomore was a Mark Reynier inspired vision back in 2002 to make the most heavily peated Scotch whisky ever. 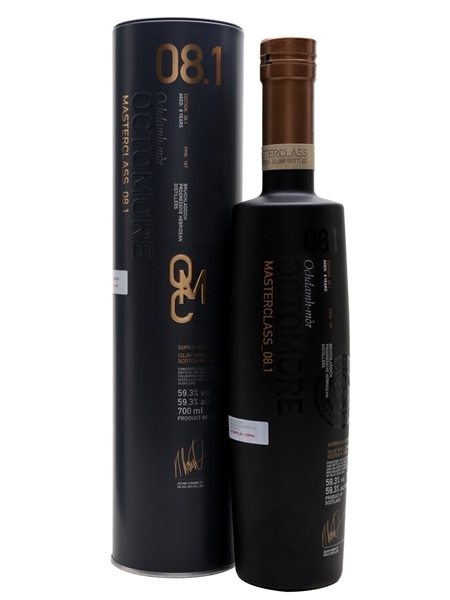 In 2008, that dream was realised with the release of Octomore 1.1, the first edition, released at a phenol level of 131ppm, the heaviest peated whisky in the world, at that time. Since then, there have been many Octomore releases, one even breaking the 300ppm barrier. For such heavily peated whiskies, they are surprisingly approachable, with delicate flavours to explore. This release, 8.1, is one of four in the Masterclass series. It is made from Scottish barley and comes in at 167ppm. Matured for 8 years in American oak, it is bottled at 59.3% ABV.